I was provided with an ARC of the book in exchange for an honest review. Initially, I was not at all certain as to what to expect. The blurb got me searching the internet for as much information as I could about the premise of the story. When I realized that there was not much to go on and almost every search that turned up somehow pointed back to the upcoming book: A Book About a Film, I started reading it with much more interest. Author C. W. Schultz’s fourth release A BOOK ABOUT A FILM is a matchless thriller focusing on a low-budget movie called THE CORNFIELD PEOPLE, which follows journalist Joe Fischer as he investigates the titular group. The Cornfield People are a secret society who know the meaning of life and what comes after death. It is essential to the Cornfield People that their knowledge remain hidden from outsiders, and they will stop at nothing to protect their secret. Schultz surveys censorship through the means of violence in this chilling and unforgettable book. This satire on film-criticism takes on a double-narrative, with one acting as a novelization of the movie, while the other examines the film’s hidden messages, motifs and haunting obscurity. This is a narrative about the plot of the above said film which is said to be lost while some think of it as an urban legend. The plot of the film is explained in a manner that prompts the reader to visualize each scene. The author not only describes the setting, but also talks about the camera angle and each character’s current position in the scene. Added to this are annotations where the author has interspersed his research along with the thoughts and quotes from several well-known film-makers, writers, producers and others in the field of film-making. The story is intriguing, dealing with a group of people who claim to know the truth about life and what comes after death. We do however, meet some characters who are portrayed as cold and calculating. The bottom-line of the plot comes down to protecting a secret for the greater good, to protect mankind and the extent to which people can go to accomplish this. There are many references to breaking the fourth wall and how the characters are seemingly aware of their audience. This has been described in detail and analyzed in several instances. The author has made sure to bring out these points quite clearly. The principal character, a journalist by profession is shown as intelligent with a slight sense of humor reflected when he encounters different situations while he has been tasked with investigating the Cornfield People. There are instances when we see the analysis provided while trying to narrow down a time frame or period for when this film may have been taken. With little to no information, these first hand and second hand reports add some mystery to the book. The story does fall a little flat at times where a sense of mystery is created but the author doesn’t go deeper with the explanation. However, this does not take away from the beauty of the overall idea. Got any books released after the 1980s on your bookshelf? Maybe something by Stephen King? Jack Ketchum? George R. R. Martin? Of course you do. Go ahead and grab one, and take a look either on the back cover or the first couple of pages. Odds are, there will be an excerpt from Kirkus Reviews. Well, they had a chance to read A Book About a Film and had some pretty nice things say. Read the full review below, and stay tuned for more as September 8th approaches. Schultz’s (Jill, 2012, etc.) novel looks at the apocrypha surrounding an infamous lost film. In this metafictional work, a fictionalized version of the author describes a film that he claims is real, although he acknowledges that many people believe it to be an urban legend. At the same time, he attempts to publish this account with a fictional publisher. If the plot sounds tangled, that’s sort of the point, as this novel is set in the underground world of rare, lost, and legendary independent films, where the smoke and mirrors surrounding a movie can prove more deceptive than those used to make it. The film, known as The Cornfield People, among other titles, is a low-budget neo-noir shot between 1999 and 2001. It follows a journalist at a paranormal publication investigating the eponymous secret society, which is willing to go to great lengths to protect their esoteric knowledge of life and death. The book opens with a foreword explaining that this book is actually the second edition of A Book About a Film, the first having been so explosive that the publisher was forced to redact it, due to an apparent shadowy conspiracy working to keep all knowledge of the film from the public. Even so, “there are still many out there who object to this version as well, as they believe what is reported in these texts are a threat to everyone,” says the foreword’s author. Schultz then offers an annotated, scene-by-scene account of the film, along with supplementary materials; the texts become progressively more sinister as the film’s plot begins to bleed into events of the “real” world. Overall, the novel’s conceit is rather ingenious. However, the author unfortunately gets in his own way when it comes to its execution. The story’s tension is undercut by its jocular tone, and the author isn’t enough of a skilled ventriloquist to successfully mimic the array of critics and film experts whose quotes populate the text. Additionally, the film at the center of book simply isn’t persuasive enough to support all the marginalia. Although this book is fun at times, readers will be left wishing that it had just a bit more polish. A story with a great premise that never quite takes flight. 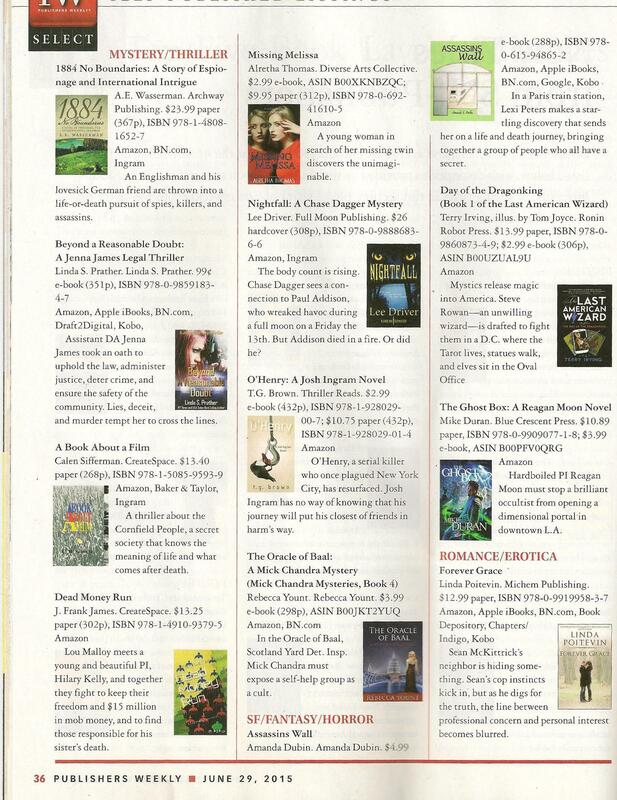 With less than eight weeks to go, marketing for A Book About a Film is strongly underway, with a couple of rave reviews and an appearance in Publishers Weekly. Other exciting appearances are expected as we approach the release of Schultz’s fourth book on September 8th! Joanie Chevalier, author of Deadly Dating Games: Murder. Blackmail. Romance., endorsed A Book About a Film, giving it a ★★★★★ (out of five) review! C.W. Schultz is a brilliant author. Or is he? Writing a book about a film about Joe Fisher’s experience while investigating the Cornfield People, a secret society that knows the meaning of life and what comes after death, calls for a medal of bravery or dare I say it aloud, a badge of stupidity. There are many out there who believe that anything written about this subject is a threat and even those interviewed advised not to release the book due to safety issues. Because of this, I am not really the reviewer/author named Joanie Chevalier. I don’t want my life threatened in any way; I love my life. Therefore, I hacked into Ms. Chevalier’s computer and I shall remain anonymous. This is all I care to say on this subject. Just like the man on camera, I too, enjoy an apple martini every now and then and now I have the knowledge of things that are better left unknown. But is this a gift or a curse? Just like any good reviewer, I analyzed the research given about the Cornfield People and noticed that some called it a cult. Cults are scary and while I appreciate the fact that the author couldn’t get his book properly edited out of fear, it is a crime to subject readers to the kind of erRors we were burdened with. That, and the hundreds of footnotes which were reminiscent of expensive heavy college textbooks. The author dared to state his opinion in Fn. 98 [or was it Fn. 96?] that Cornfield Persons are clowns. Reading in context, the author wrote, “these Cornfield Persons look like a bunch of clowns.” I respectfully write this in quotations so that certain persons would know it was not me who originally dare write these words down on paper. However, coming to the defense of C.W. Schultz, I concluded from the author’s other remarks that this was probably a cover up for his true fear. Writing about red-herrings is probably a cover up too, with Mr. C.W. Schultz presenting us with a “journal,” a silly “song,” and a “word search” (email me if you too find the phrase “Cornfield People are Clowns” diagonally and backwards in the red herring word search). The Cornfield People are a proud society and was formed over a hundred years ago. I dare you to google who was alive back then; you may be surprised. Read the book. See for yourself. Find the answer to the question: Is it possible to hang yourself with a coat hanger? Only C.W. Schultz can bring that answer to light as he courageously researches and writes, A Book About A Film. I commend you Mr. C.W. Schultz. Thank you for giving me more questions than answers. Fn. 56 [Note: Footnotes 1 through 55 must NOT be read by the public.] The day after I finished the book, I noticed a suspicious looking man dressed in a burlap sack (I just thought he was homeless, sorry) eagerly looking over my shoulder as I was typing the review during my lunch break while sitting on a bench at the park. The next day I found a sheet of paper under my windshield. All it had were five symbols, drawn in red crayon: stars. I took this to mean only one thing – to rate this book 5 stars . . . or else. I rest my case. Fade to Black. On May 21st, 2015, book reviewer Nick Rossi posted a rave review of C. W. Schultz’s upcoming fourth book A Book About a Film on Reading Other People. 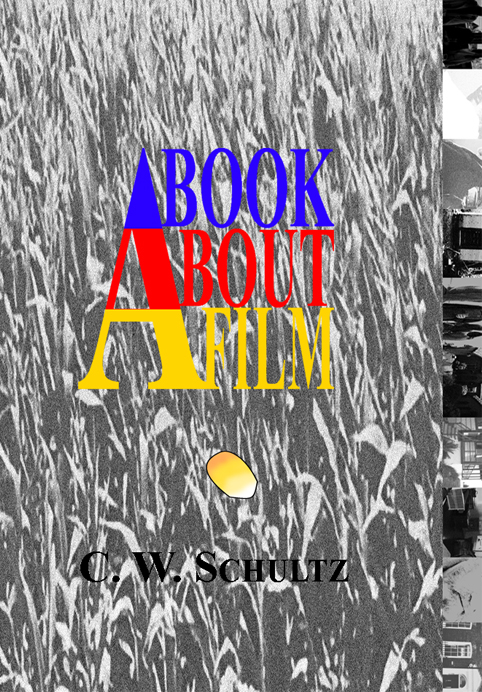 www.cwschultz.com decides a wonderful review of an exciting release warrants enough enthusiasm to finally reveal A Book About a Film’s release date as Tuesday, September 8th, 2015, as well as the front cover! This should mark the beginning of updates on a project Schultz has been pretty secretive about. Stay tuned as the reveals continue to pile on! It doesn’t get more meta or self-referential than this. C.W. Schultz’ original and effervescent work A Book About A Film is subversion at its best. It beckons the dream-like quality of Fellini’s masterpiece 8 1/2 with a touch of Grey Gardens. It’s like that great movie M. Night Shyamalan has yet to make. I absolutely do not want to spoil the narrative for any prospective readers. I will say, however, that Schultz’ uncanny ability to write a work that has an inherent momentum which does not lose any steam is revelatory. I’ve read a lot of books that borrow elements from various genres that attempt to amalgamate them into a piece that will appeal to all demographics. A Book About a Film, however, is heads and shoulders above its subversive predecessors. It maintains the readers interest, utilizing imagery that is both evocative yet easily visualized. It’s a thriller, a neo-noir and the Blair Witch Project all rolled into one cohesive narrative that held my interest in the palm of its words from start to finish. I was not only riveted by the plot mechanisms that managed to delve into the mentalities of secret society members, in this case, The Cornfield People, but I was also astonished by the authors effortless ability to weave varying styles into one masterpiece so successfully. Maybe its because I’m a film graduate, or maybe its because I watch a lot of films, but I found A Book About A Film to be the equivalent of that rare director commentary on the DVD of your favorite semi-obscure movie. You’re in awe of the director’s ability to present subtle motifs without exploiting the intricacies of the characters and their flaws. Schultz is destined for greatness, and A Book About a Film is a book about life – the kind of life that is real, gritty, and dark. A Book About A Film will be released in September 2015. I will write another post to remind you all to be sure to pick up a copy. There will be some exciting updates for A Book About a Film in the near future. In the meantime, if you like movies, check out movie critic Geekster On Movies’ latest edition of his annual Geekster Guide. C. W. Schultz’s fourth book A Book About a Film is set to be released in late 2015. Marketing and press releases will be throughout the year. An academic study on the cult classic The Cornfield People, A Book About a Film not only acts as a novelization of the movie but also dedicates a great amount of its content to the film’s hidden messages, reoccurring themes and haunting obscurity. Some have called The Cornfield People an incomplete film, while others believe it is a true lost film; however, many believe that the film is banned and have pointed out that sites which attempt to host images or clips from the movie have suspiciously removed the content even though there is no trace of The Cornfield People ever being copyrighted. Paperback and Kindle editions will be available at the same time, but a hardback release is currently tentative. 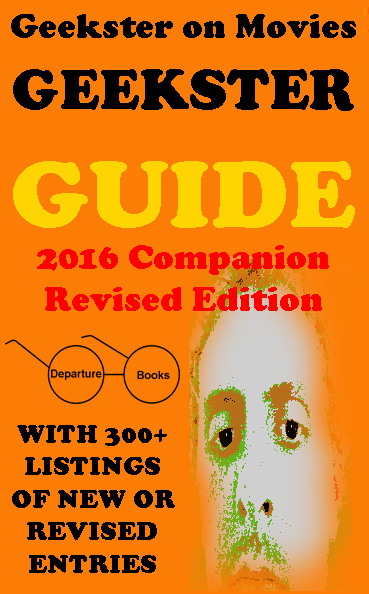 Due to the book’s unique page layout, paperback is the recommended edition and is expected to have a starting price of $16.99 (likely cheaper), with signed copies and giveaway opportunities within the first few months of release. For more information on giveaways and signed copies, please use the contact form. For other questions or to discuss Schultz’s upcoming release, please feel free to post in the comment section below. 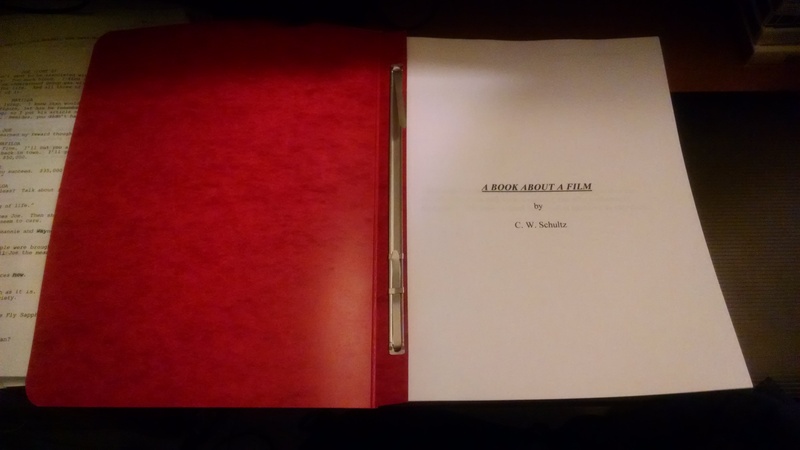 A Book About a Film is ready for copyediting. One step closer to being complete. Schultz’s fourth book had a few false starts beginning in April 2013, and a rough draft was not completed until July 2014, so this is some exciting news. How about hashtagging #ExtremelyFreakingExcited or #OneStepCloser or simply #ABookAboutAFilm?